As we enter into 2014, there are, yet again, a number of important milestones for us to reach in the fight against satellite interference. Driving Communications On The Move, By Bob Gough, Managing Director, Carrick Communications, Ltd.
Media, resources, maritime and aeronautical industry requirements from commercial and consumer perspectives are growing at an increasingly rapid rate. 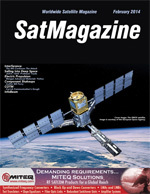 Global demand for Communications On The Move (COTM) is driving the evolution of the satellite industry to continue to provide fresh capacity and develop the associated technologies. Along a neatly landscaped road in Mountain View, California, sits an understated industrial building. The building houses a newly installed Moog electrodynamic shaker table. When researchers at the Australian National University (ANU) started their search for a material from which to make a custom-made plasma cavity for a new gas plasma space engine, they were directed to Morgan Advanced Materials, a world leader in high purity Alumina custom-made, high precision ceramic components.